These devices contain four independent 2-input-NAND Gates The open-collector outputs require pull-up resistors to perform correctly. They may be connected to other open-collector outputs to implement active-low wired-OR or active-high wired-AND functions. Open-collector devices are often used to generate higher VOH levels. The SN5403, SN54LS03 and SN54S03 are characterized for operation over the full military temperature range of -55C to 125C. The SN7403, SN74LS03 and SN74S03 are characterized for operation from 0C to 70C. This is one package pinout of SN74LS03,If you need more pinouts please download SN74LS03's pdf datasheet. 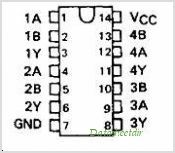 SN74LS03 circuits will be updated soon..., now you can download the pdf datasheet to check the circuits!